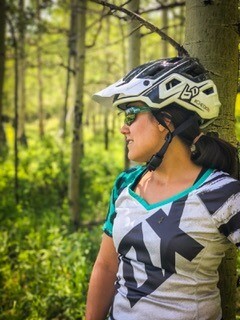 We want to mention Tricia as inspiration for getting this guest blog collaboration together as she was a friend of ours as well as so many others in the Colorado MTB community. Through sharing about Tricia’s loss with friends in the biking community I found out this is happening to far too many loved ones in our bike community around the world. We began to wonder what we could do as part of the bike community to help others struggling and bring awareness to the struggle with proactive ways to better understand, help those impacted by mental illness, and hopefully play a part in suicide prevention. This brings us to Renee Hutchens and April Paige who are courageous ladyshredders based in Colorado who are both passionate about riding bikes and share a mission to build a community of support for individuals in the bike community who battle with mental health and suicide. Each share their personal journey of courage and how suicide has impacted their lives from different perspectives. These two stories bring this mission to life, and combined together tell one powerful story of purpose, to break the stigma of mental health and suicide, tear away the isolation one feels, and build a community together with open communication, compassion, love and understanding. Click here to read "Inside the path of suicide, a battle not meant to be fought alone"
Click here to read "Finding hope, life, and self-awareness. Time to Check-In"
Taking leaps has always been a passion of mine. You could say I was born to leap off stuff. As a small child, I jumped out of trees into piles of leaves. In high school and college my favorite sport was “jumping off of things into bodies of water". Some examples of this include cliff-jumping at a local ravine and train trestle-diving at a nearby lake in central Wisconsin. In the Army, I signed up for a special course called Air Assault- the crowning achievement being a rappel-assisted jump out of a helicopter. When it comes to those less tangible leaps, like choosing to go to grad school, getting married or moving to a new part of the country, I’ve always been more cautious. Fast forward a few years and I discovered mountain biking, and a whole new endeavor that allowed me the ability to launch myself off things. I slowly became more and more immersed in mountain biking. There were a lot of unintentional leaps, crashes, and plenty of moments of self-doubt. It turns out that even for someone who dreams about finding things to throw herself off of, it’s not always easy to take leaps. The first real drop I ever hit was at Keystone Bike Park at a skills clinic. I was only able to get up the nerve to hit the 3 foot drop after watching multiple people flawlessly execute the feature first, and then being “towed in” by my good friend Sienna. After that first drop at Keystone, I thought I would be able to hit everything obstacle I encountered on the trail. Not true. These days I fancy myself a mountain bike skills coach and a professional enduro racer. I’ve competed as a pro in 5 countries and occasionally even landed on the podium. I may have been born with a strong desire to jump off stuff and a passion for mountain biking that has taken me to the highest level, but that doesn’t necessarily mean that it’s easy for me to take a leap. Despite all these accolades, I find that I often have to gain strength from the support of others when I’m looking at leaping into a new style of riding or a different career endeavor. Just a few months ago, I sent my first road gap (squeal), but only after a kind stranger offered to tow me in and demonstrate the proper speed (thanks again, kind stranger). I don’t always recommend taking physical leaps or falls off a mountain - they can be dangerous (just ask Christy)! But when it comes to those real leaps, like changing your lifestyle or conquering a fear, I do recommend that you: ask for help, practice and tell people. This can mean you tell your boyfriend or your neighbor or the WHOLE INTERNET, and then LEAP! Facing your fears and taking a leap is something that we can all get better at with the right tools. Taking leaps is the key to learning to fly! I recently decided to try something completely out of my comfort zone: the Colorado Trail Race. The CTR is a 500+ mile, self-supported bikepacking race. My goal is to finish. I asked for a coach to help me train and for other experienced bikepackers to help me plan. 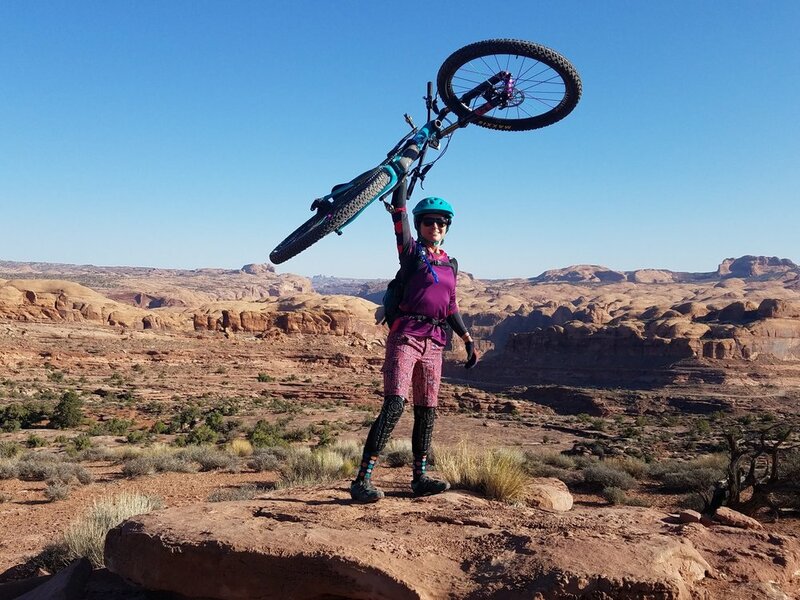 I’m going to go on lots of mini bikepacking adventures for practice and I’ve made this leap public by deciding to race as a fundraiser for the Check-In Foundation, in memory of a dear friend and fellow mountain biker, Tricia Leigh Shadell. I’m telling everyone about it and I hope that I’m able to help keep Tricia’s spirit of kindness with me as I fly across Colorado this summer. Every rider wants to improve in some way, however finding the tools to effectively do this can be costly or hard to come by. We put together the best exercises that anyone can do from their house or backyard. These tips are designed to help riders come back stronger next season. Kick off the new year right with these 10 activities to help you stay in shape and even progress your riding in the off-season. All of these are exercises that Dr. Christian Little has developed through her experience working with athletes at Yeti, Trek, Rocky Mountain, Red Bull and around the world. Hips tend to be tight with both flexibility and mobility impairments in mountain bikers. This can lead to back and lower extremity injuries. If mobility of the hip joint is impaired, it results in the inability to utilize full range of your hip and generate optimal power in your pedal stroke. This prevents the riders from being able to go faster or power through sections of trail. Use a thick Theraband or bike tubes around leg to mobilize hip (Photo: 1). You should feel the stretch in front of your hip as band becomes taut in half kneel position. Follow mobility up with half kneel stretch (Photo: 2) for 1 minute to promote further movement OR if on trail place front leg on bench or back of car for stretch in standing (Photo: 3). Tip: Side stretch torso to increase stretch. Don't arch back because that minimizes stretch by lengthening the hip flexor and loads your back. Thoracic and rib mobility is important to breathing properly. It's not uncommon for mountain bikers to have thoracic issues due to past falls, often times without even realizing it. In physiotherapy, significant improvements can be made in this area utilizing manual therapy techniques. While physio is the best way to remedy this issue, there are at home exercises which can help with mobility. Having full range of motion and being able to breathe easier is going to allow you to ride up and down the trails faster. Foam roll on thoracic spine for 2 minutes and mobility ball on right and left sides of spine for 1 minute. Support neck with hands and bend knees with both foam roll and ball (Photo: 4). With foam roll you will roll along your thoracic spine (upper to mid back) and with the ball you target tight spots and hold until it releases (Photo: 5). Also, shown is where to target lower into lumbar area (Photo: 6). See what's tightest on yourself. You can use both or may find one works better than the other for you. Follow mobility up with movement by doing sidelying stretch for 1 minute (Photo: 7). Tip: invest in a ball and foam roll. Many helpful uses for them to keep you injury free! Be sure to always follow up mobility with movement to keep you moving at your best to help your performance and prevent injuries! While our hip flexors are in a short position most of the day, so are our pectoral muscles. We sit slouched over, rounding our shoulders, shortening our pecs and get on a bike which is a similar posture. We simply need to avoid injuries and imbalances in our upper body by stretching these tight pecs out. Consistency is key in relieving pectoral tightness. Lay on stomach and bend back top knee 1 minute on each side, (Photos: 8&9). You can see front and back view in pictures of how to perform. If you are already feeling the stretch before getting fully rotated, ease up by placing top leg on ground to not-over rotate. Progress into further rotation with leg as you improve pec flexibility. If very tight do side lying stretch and side lying arm circle (if you have a injured shoulder skip arm circles). Sidelying stretch: Hold top bent knee with bottom arm and reach back with top arm (Photo: 10). Avoid forcing the position if it's not coming on its own, go as far as it allows. Breathe into the stretch instead of holding your breath, allowing your muscles to release. Both pec stretch options are good “bang for your buck” exercises, which target more than just your pecs. Both stretches target upper body, spine, and hip areas all at once. Every mountain biker will benefit from doing these, given where we get common impairments. In our first day we emphasized how mobility and flexibility of the hips is important. It focused on mobility and followed up with a stretch to gain further motion in tight hips. Now we are targeting the hip flexor and piriformis with ball work, following up with stretching to gain further motion. These flexibility focused exercises work well for common impairments found with mountain bikers. To target hip flexors, put a ball on the hip (Photo: 11) for 1 minute on each side while laying on your stomach. Breathe into the exercise to help release the tension in your hip. Follow up ball work with stretching to help gain further motion. Half kneel stretch with arm reach (Photo: 13) and piriformis stretch (Photo: 14). Perform 2 sets of each at 30 seconds. Core strength is important, but it's about more than crunches. Mountain biking requires incorporating core strength in dynamic and functional ways. It impacts your ability to ascend and descend technical terrain by balancing your upper body. The stronger your core the more control you gain in micro movements, allowing you to correct your bike and hold it upright at fast speeds and through challenging trails. Single leg romain dead lift: 2 sets between 8-12 reps to start (Photos: 15&16), progress to reaching with arm at a diagonal (Photos: 17&18). Important to keep level hips and move in a slow, controlled motion. Tip: Keep back flat on way down and squeeze glutes and core on the way up. Sidelying plank: With bottom leg down and top leg up, perform circles clockwise/counterclockwise, 30 seconds on each side (Photo: 19). Leg strength is one of, if not the most important part of getting our bike up and down the singletrack. They're where most of our power is driven from and a large factor in how we find balance on the trail. Here are some ways to help with injury prevention and to ensure you are feeling strong when biking season starts up again. Single leg squat (Photo 20&21): Start on a flat area to ensure proper mechanics, then eventually progress to performing on an unstable surface such as a disc or towel. The ability to perform dynamically on unstable surfaces is what you will encounter when going over technical terrain on your bike, so it's good to replicate in your exercises. Tip: avoid caving in at knee or knee over toes. Important you feel the burn in your glutes too and not just your quads. 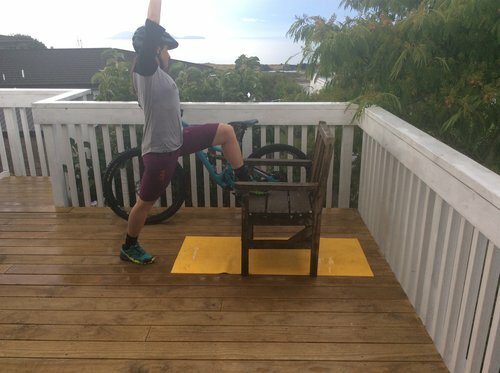 Single leg squat holds (Photos: 22&23): With one leg pushing into the wall, bend your knee into your bike position for descending, hold it there. Start with doing this in 2 sets at 60 seconds each. Make sure you are not leaning against wall with your upper body, and that it is in a straight line with torso. On a side note: Many riders either stretch or foam roll their quads as a way to relieve tight muscles alongside their normal routine. With mountain biking your upper body is getting a workout alongside your lower. Starting to ride again, you will feel more fatigue in your body without proper off-season training. Arm strength allows the rider to descend faster, longer and on more technical descents. Being able to take advantage of pumping through a race without getting worn out as fast can be the difference maker at any event. Prone plank on forearms to hands and repeat (Photos: 24&25), starting off with 10 at a time and progressing to 50 in one set. Tip: Work on smooth and controlled transition from forearm plank to hand plank, make sure to not arch your back. Time yourself and see how long it takes to do 10 times at speed without compromising quality of the plank. Want a real challenge? Try putting a balance disc under your feet which makes you feel unstable and forces your core into micro movement control of your body. The off-season is a great time to hone in bike balancing skills that can be done from anywhere while the trails aren't rideable. While balancing you are utilizing micro movements throughout your body to stabilize yourself, which your body will remember and help control your bike in tough situations later on. Track stands, wheelies and manuals might often look like they are for show, but both require key techniques that enhance your riding. Track stands get the biker used to little or no movement on the bike while standing upright, good for those technical slow sections or tight turns. Similarly, wheelies and manuals allow the rider to get used to balancing on the rear wheel, making riding transitions over various terrain more smooth. Tip: Flat pedals and shoes work best to practice the skills. Track Stand (Photo: 26): Stand up on your bike, keeping movement to a minimal. The idea is to be as virtually motionless as possible, however even the pros are not completely motionless. Tapping the brakes and keeping the front wheel angled are two ways to help keep balance. Wheelie (Photo: 27): Get in a middle gear so it's not too hard, but not too easy to pedal. Pick up the front wheel of the bike by lifting with your back, keeping your arms straight. Maintaining the wheel up is a delicate balance between rear brake and pedal strokes. Tip: lowering the seat slightly below its normal height often helps improve stability. Manual (Photo: 28): While descending with your seat in a low position, drop your hips then pull them back, which will force the front end up in the air. The movement should look like an L from the side with the downward movement first, followed by horizontal. Keep your finger near the rear brake and tap it to maintain control and prevent yourself from flipping backwards. Start with slower speeds and progress from there. Mind: There are several tools known to help athletes with the mind through strategies to better manage stress, PTSD, and their mental edge in performance. Of these, meditation has been shown to be one of the most effective tools, and is a strategy proven by research to help. Using some of the apps such as Calm to be a helpful tool to guided meditation. This will be discussed in further during our Moab retreat in April, along with further information to amplify a racers mental edge. Body: Yoga is important for helping to open those tight areas of our bodies such as our hips and pecs. Breath work helps lower stress levels and can also be used to improve performance on the bike through a better awareness of proper breathing. 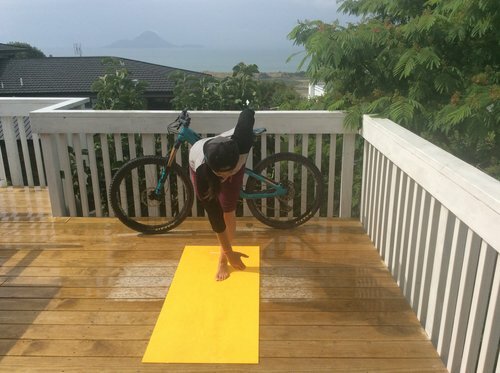 Balance work is integrated into yoga and is important to maintain and gain better balance whether we are recovering from an injury or riding our bikes. If you are trying to get into yoga but not sure how, follow the pictures below in sequence once a week to start off. See if you notice an improvement in your mind and body after doing these poses a few times. Soul: This is different for everybody. For mountain bikers this is generally getting outside and hitting the single track or going for an adventure. For some it may be connecting with new and old friends, sharing laughter, or traveling to a new destination. For others it can be surrounding themselves with support and encouragement, or finding faith. Find what makes you happy and be sure to incorporate that into your life. Cross training and diversifying activities in the off season is important. Your mind and body will thank you when it comes time to bike again. Try something new! Ski, surf, rock climb, canyoneer, kayak, slackline, hike, learn to play an instrument even. Just like the seasons change, you should be utilizing periodization to optimize your performance to peak during bike season. Not sure if you're utilizing proper periodization, then you may consider working with a mountain bike coach or physiotherapist that specializes in working with athletes to help you develop a plan. If you are not already, go out and try something different in the next week. We love to bike and it's important to condition properly leading into the season, but it's good for our mind and body to have a break from the bike from time to time. That's a wrap for our 10 tips to help start off your new year right. Tell us what some of your favorite exercises are and let us know if you have any feedback, we would love to hear it! Contact us through social media, the comments below, or at Leap2Fly.com. Good luck in the new year and we hope to see you crushing trails in 2018 and beyond!